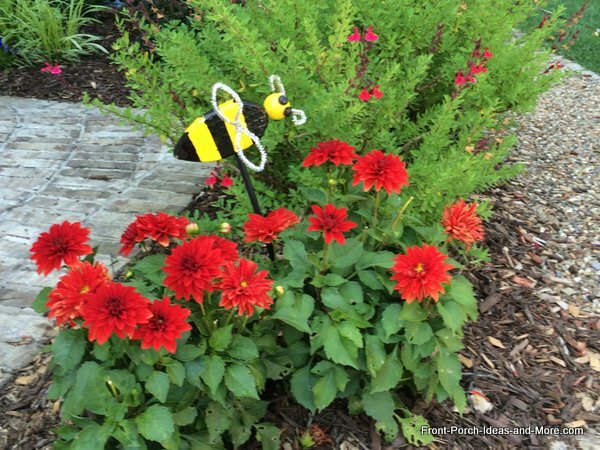 Our bumble bee decorations are perfect for your front porch or garden. 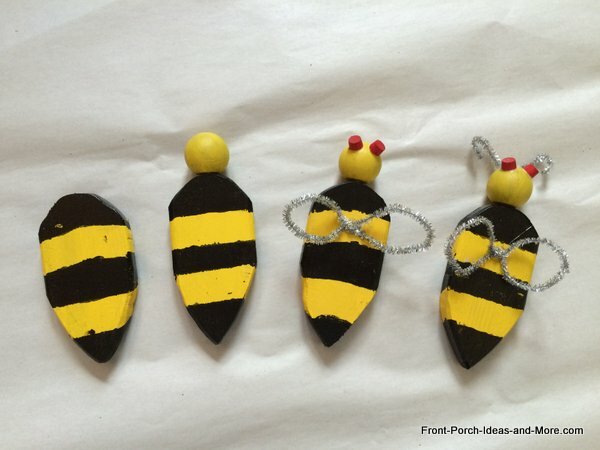 Your kids will love making these with you; we used scrap material, some yellow and black paint, and a few silver pipe cleaners. 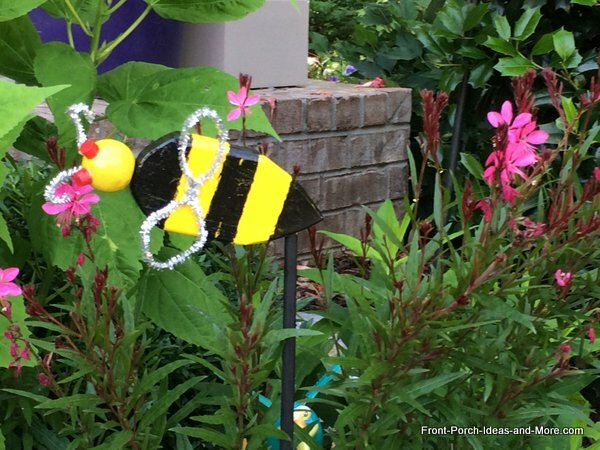 Mary and I enjoyed making these with our grandchildren and they look fantastic on our porch and in our porch landscaping for summer. They create lots of interest and add color too. We made these from scrap wood but you can also purchase treated fence slats which are very inexpensive. 1 round wooden ball (available at Home Depot/Hobby Lobby, etc.) Please note that I used threaded wooden balls (in photo above) I had on hand; there is no need to use those). 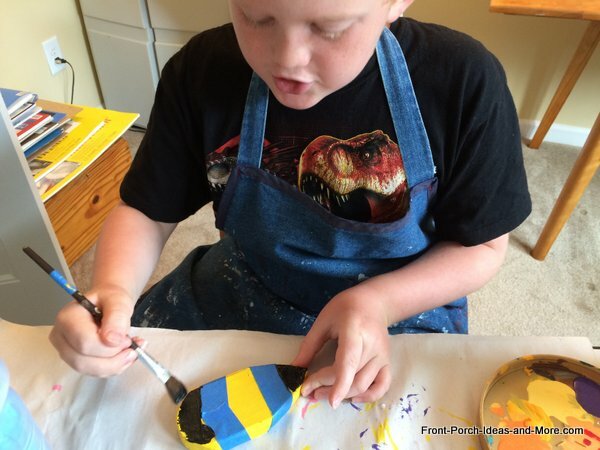 Begin by drawing the shape of a bumble bee on the piece of wood and cutting it out with the jigsaw or band saw. Sand the edges smooth. 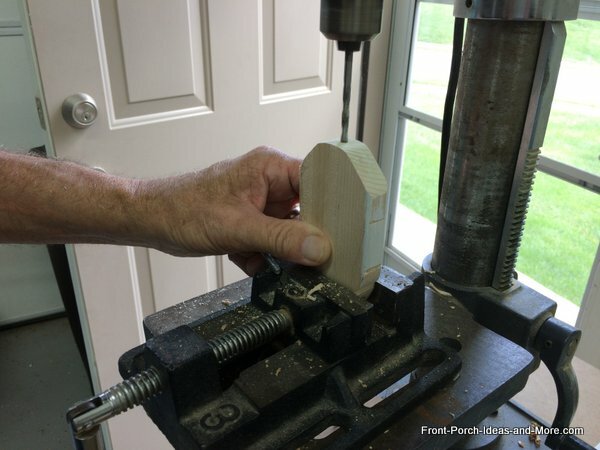 If mounting on a dowel like we did, drill a 1/4 inch hole along one edge of the body depending on how you want to display the bumble bee. 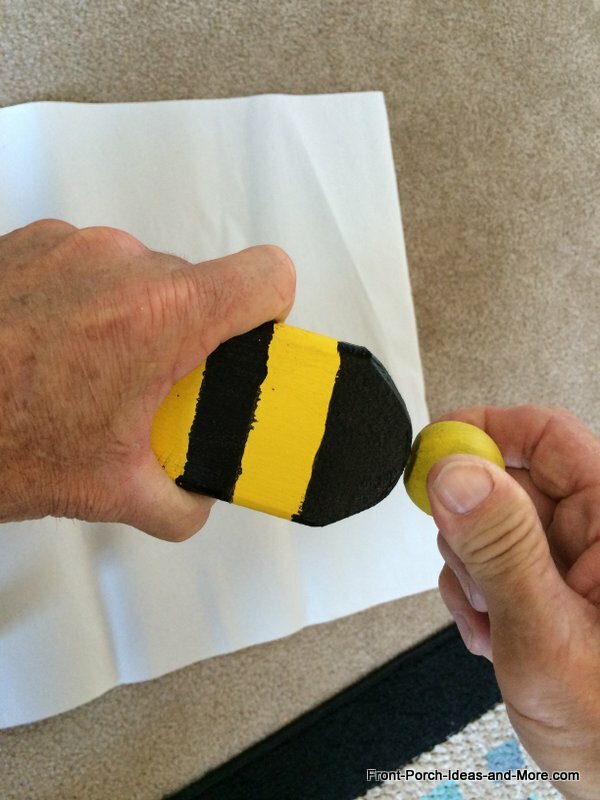 Glue the round ball on the piece of wood for the bee's head. Let dry. Cut two small pieces of dowel for the eyes (I used wooden buttons) and glue to the round ball for the bee's eyes. 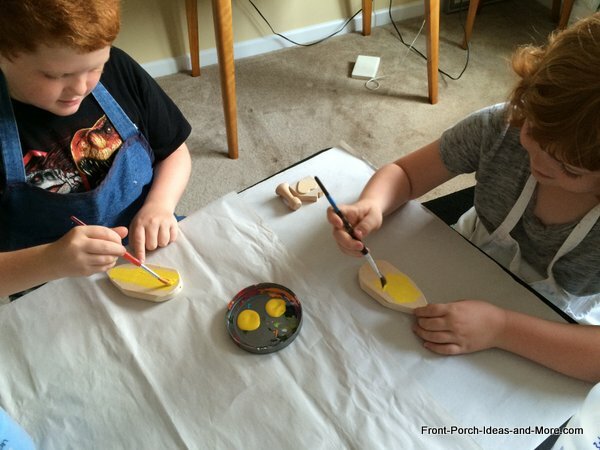 Kids painted the bodies yellow then taped off sections to be painted in black. Use alternating black and yellow paint to cover the body as depicted. Paint the head either yellow or black. Cut and shape silver pipe cleaners into wings and antennae and glue to the body. 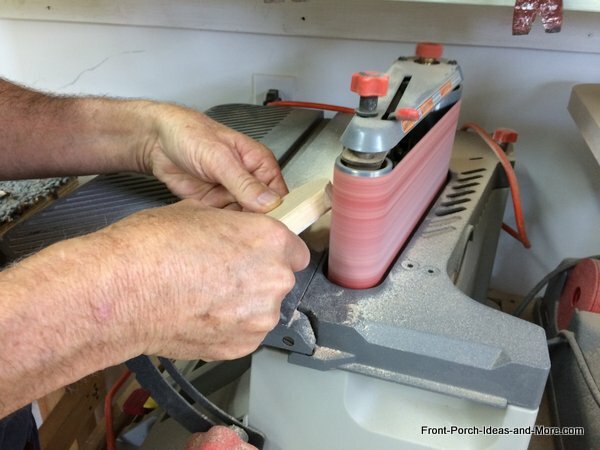 Insert dowel (may want to add a spot of glue) into the body and place in potted plants, yard, or garden as desired. We used a coat of polyurethane to protect them from the weather. 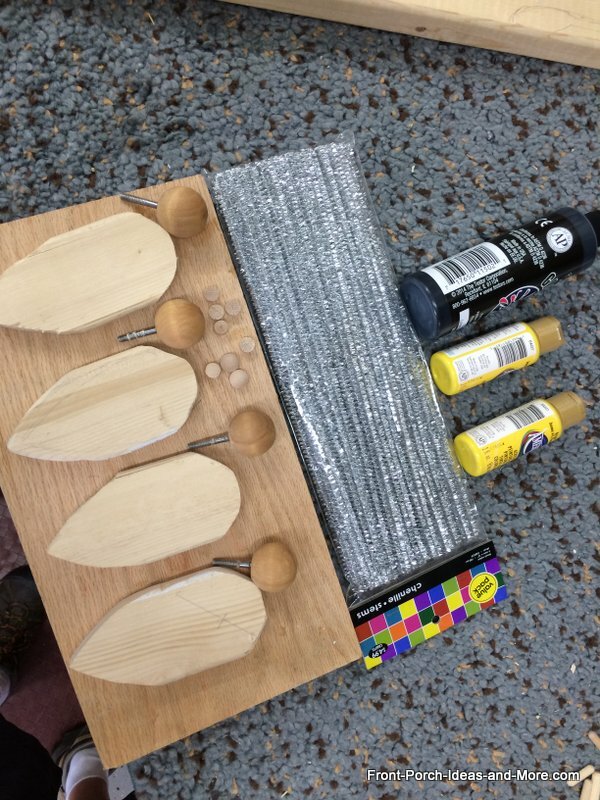 Draw pattern on large piece of wood to form a tear drop shape. 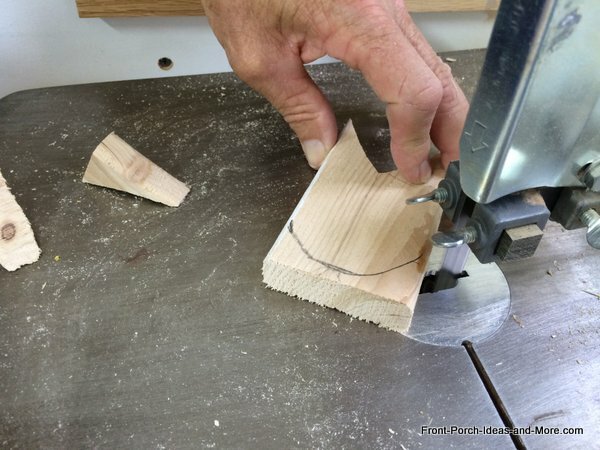 Use a jigsaw or band saw to cut out the shape and sand edges smooth. Draw lines across body as shown. I used a large bowl for continuity. 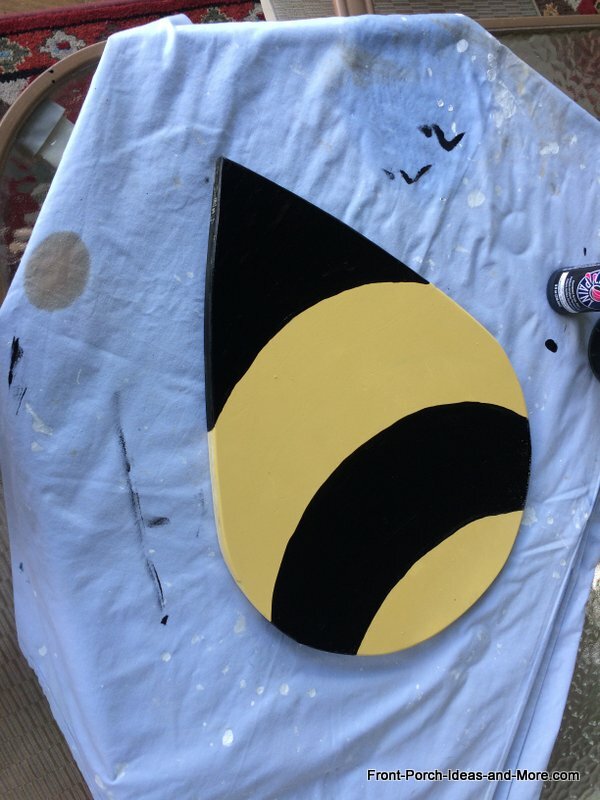 Paint segments with alternating black and yellow paint. 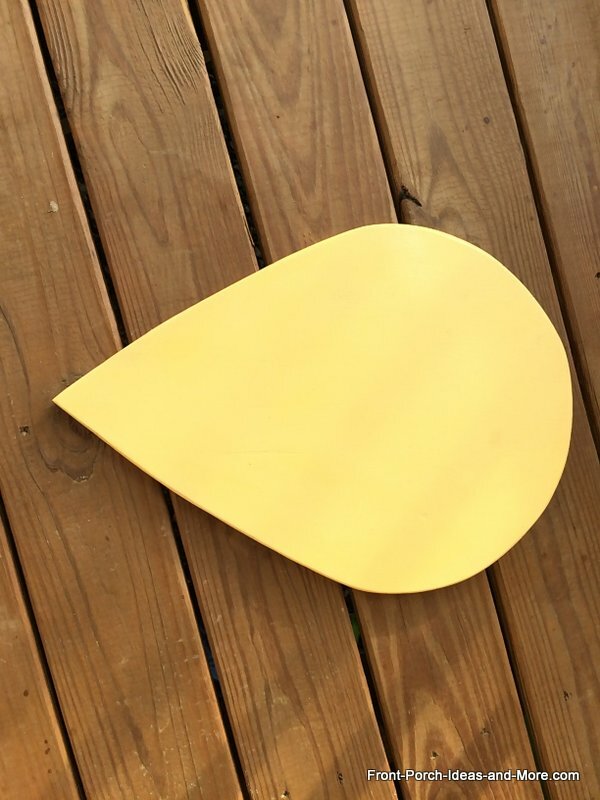 We recommend using a bright yellow color. Let dry. While body is drying, paint the Styrofoam ball black - make take several coats of spray paint. 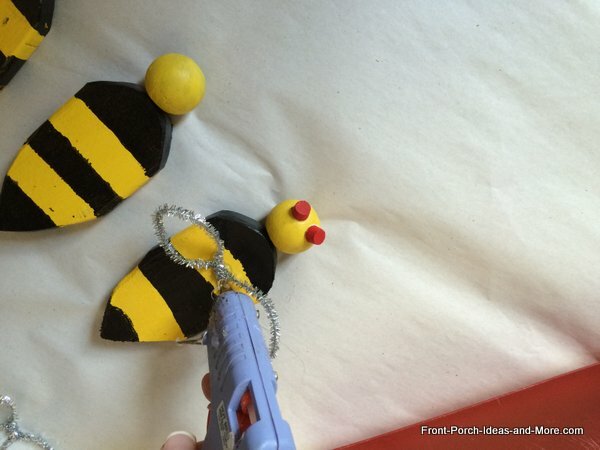 When dry, attach the head to the bee with glue (I actually drilled a 1/4 hole in top of the bee's form and attached the head with both glue and a dowel). Form silver pipe cleaners into wing shapes (may have to attach three together to form one wing) and glue in place. We used a hot glue gun. Form silver pipe cleaners into antennae and stick into head. 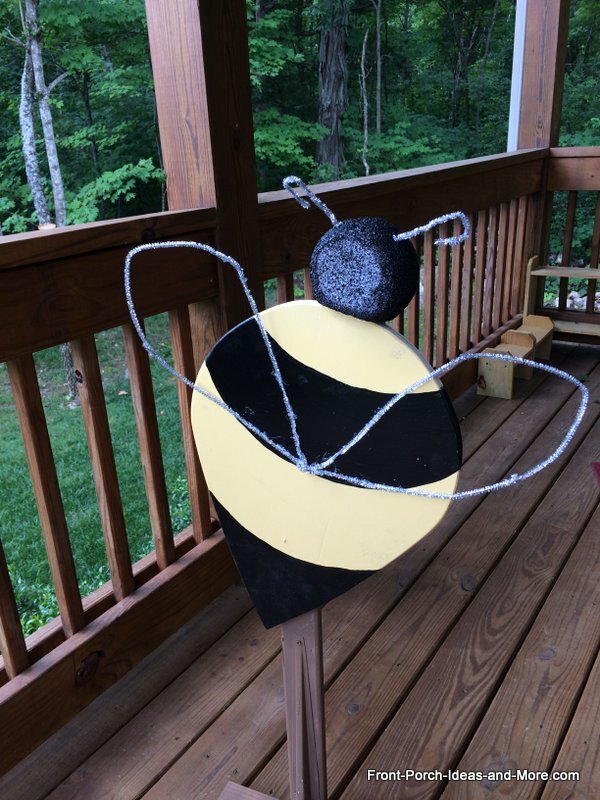 I built a stand for our bumble bee as shown out of scrap wood. 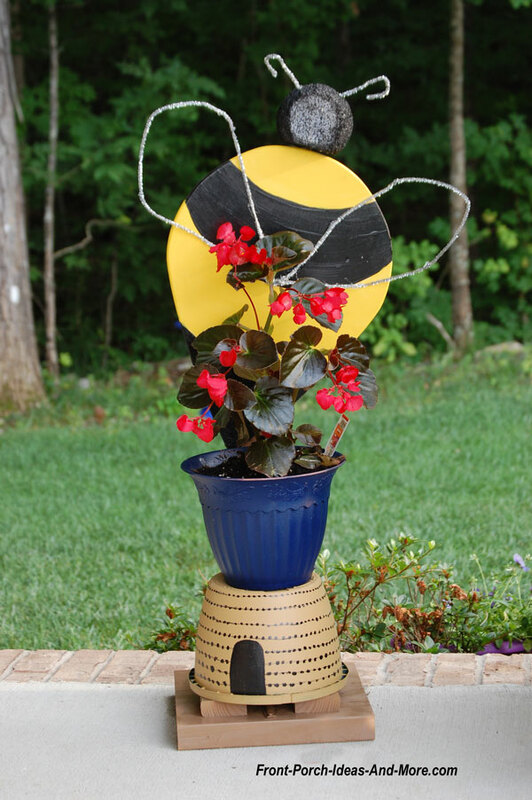 You can also hang this bee from an eave or place on your porch wall as an option. 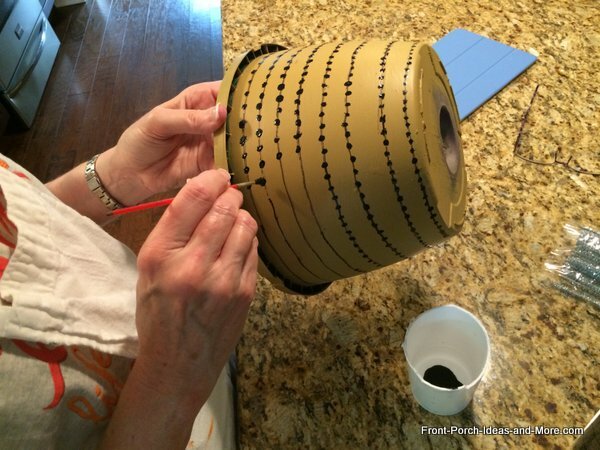 We painted a pot a tan color and Mary drew the pattern as shown on the pot. To ensure the bee does not fall over we placed a large rock (could use bricks) on the platform and covered it with the hive pot as shown. We attached it to the platform with two screws. 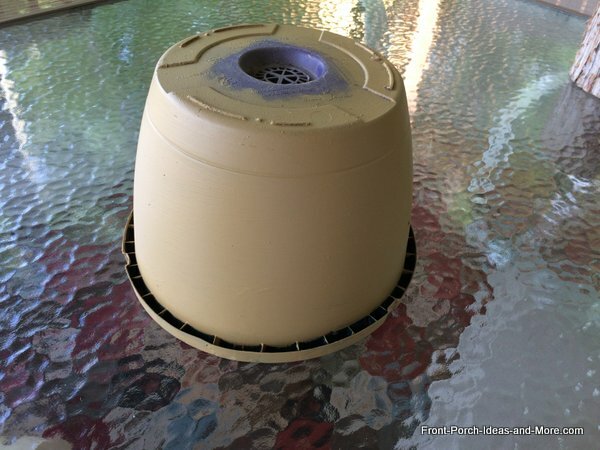 We then attached a potted plant (as shown above) on top of the hive with two screws for stability. 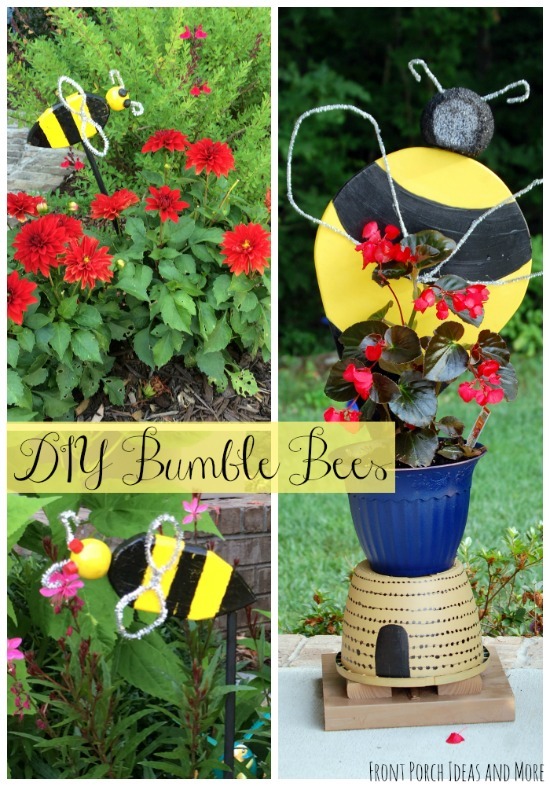 Place on your porch and enjoy your bumble bee decorations! We built a platform and support for our bumble bee as shown above out of scrap wood. As you can see in the photo, I attached a support for the bumble bee to a shelf bracket which in turn was attached to a block of wood. 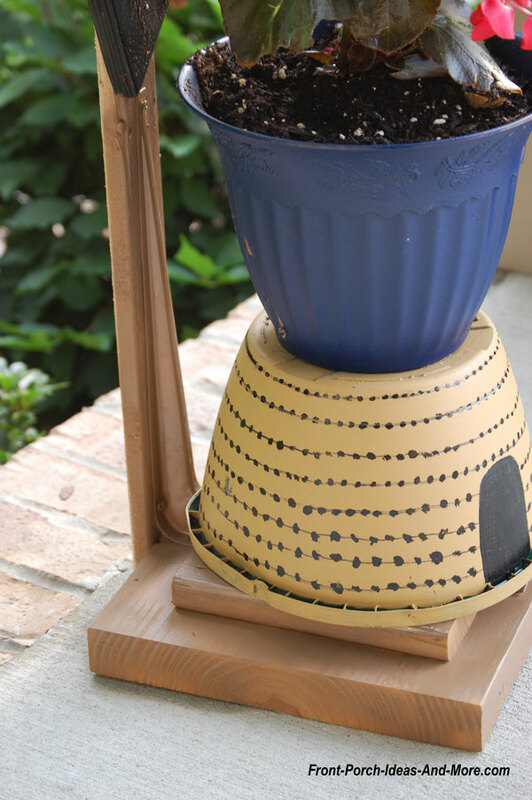 You could choose to hang yours or drill a hole and insert a dowel for placement in a potted plant, garden or yard. 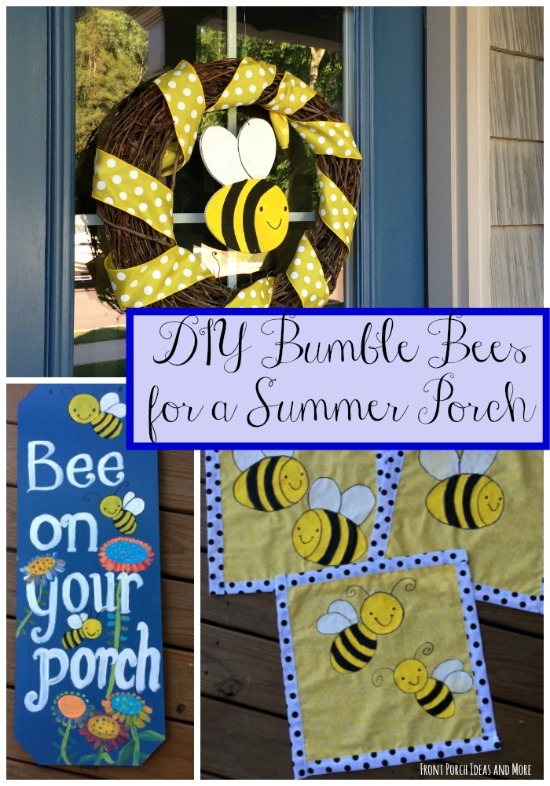 Our summer porch is pretty cute with these DIY bumble bee decorations. 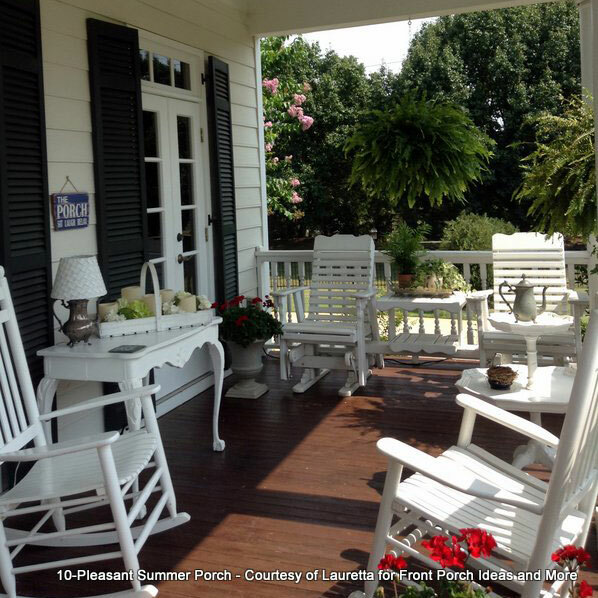 We have more pics and tutorial for the wreath, pillow toppers and porch sign.